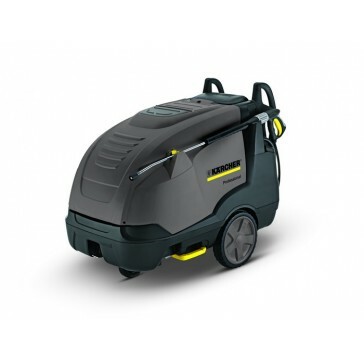 The HDS-E 8/16-4 M 36kW electrically heated hot water high-pressure cleaner is designed for use in environments where exhaust fumes are prohibited. Thanks to the innovative, highly effective boiler insulation made from a special foam, the power consumption of the machine is drastically reduced in standby mode. This allows energy savings of up to 40% compared to previous models. The eco!efficiency mode automatically switches the machine into the particularly efficient cleaning temperature of 60°C, saving valuable resources. The especially hot operating temperature of max. 85°C is particularly advantageous on greasy and oily stains, and a temperature of up to 80°C can be maintained in continuous operation thanks to servo control. A high-speed heating chamber ensures a much shorter preheating time. This hot water high-pressure cleaner can be used wherever exhaust gases are undesired or even prohibited, e. g. in food processing plants, hospitals, large kitchens or industrial plants.